Feel the spray of the awe-inspiring Victoria Falls and learn about its discovery by David Livingstone. Learn about local conservation efforts as you meet schoolchildren and villagers. Camp under the stars in Hemingway-style tents along the Okavango Delta. The thrill of spotting any member of the Big Five — elephant, leopard, lion, rhinoceros and Cape buffalo — is reason enough to journey to Botswana, Zimbabwe and Zambia. But these magnificent creatures aren’t the only ones who inhabit the grasslands and deltas of the region. Hippos, zebras, giraffes and antelope are just a few other residents that can be spotted during game drives along the Okavango Delta or in South Luangwa National Park, while crocodiles and myriad bird species bask in the waters along the Chobe and Zambezi rivers. Join wildlife experts and local residents for an insightful exploration into the habitats and conservation issues surrounding Africa’s natural wonders. This program was my fourth sub-Sahara African safari (previously: Kenya, Tanzania, South Africa). My experiences in each safari was different, but this program ranked with the best. Highly recommended. Sign up for this program now: don't delay! You won't be disappointed. What a great way to see portions of three distinct countries, meet wonderful people, be with knowledgeable and interesting guides, and see some incredible wildlife. Victoria Falls was the icing on the cake for me. This is a top notch program. This was the best trip of my life. I look forward to more Road Scholar experiences. They leave no stone unturned. Afternoon: Check in at the hotel and relax before the welcome dinner. Dinner: At the hotel, we will enjoy a buffet dinner including a starter and entrée with side dish; a welcome drink, bottled water and coffee/tea will be provided, with other beverages available for purchase. Evening: Orientation: The Group Leader will greet everyone with a warm welcome and lead introductions. We will review the program theme, the up-to-date Daily Schedule and any changes, discuss logistics, safety guidelines, emergency procedures, roles and responsibilities, and answer any questions. Game drives typically last between 3 to 4 hours in the early mornings and late afternoons, when the animals are most active. We have set aside some free time in the schedule for your personal independent exploration. Please note that program activities, schedules, and personnel may need to change due to local circumstances. In the event of changes, we will alert you as quickly as possible. Thank you for your understanding. We are fortunate to have as our Group Leader a knowledgeable expert who will also serve as our primary lecturer for most of the program. Continue getting to know your fellow participants, settle in, and get a good night’s rest for the day ahead. Activity note: Flight time from Johannesburg to Maun is 1.5 hours. Drive from Maun airport to the campsite is approximately 3.5 hours with game viewing en route. Breakfast: Taken at the hotel, breakfast is an expansive buffet featuring a variety of cold cereals, fresh fruit, cold meats and cheeses, pastries and hot items such as bacon, sausage, tomatoes and mushrooms. Omelettes, eggs and waffles are cooked on demand. Fruit juices, coffee, tea and water provided. Morning: We will check out of the hotel and board the motorcoach, transferring to Johannesburg’s OR Tambo airport for our commercial flight to Maun, Botswana. Lunch: Snack in flight and a boxed lunch will be provided in Maun. Afternoon: From the airport, we will board our open-air, 4x4 safari vehicles for our drive through typical Botswana woodlands to the Khwai Concession and our campsite; we will likely see wildlife along the way. Upon arrival at our private mobile tented camp, we will settle in. Later this afternoon our Group Leader will give an overview on the history and culture of Botswana. Located in the eastern part of the Okavango Delta, the Khwai River area abounds with wildlife. It is particularly well-known for its predators, especially one of the most endangered carnivores in Africa, the wild dog. Lion and leopard are commonly found, as well as herds of buffalo, elephant and hippo. 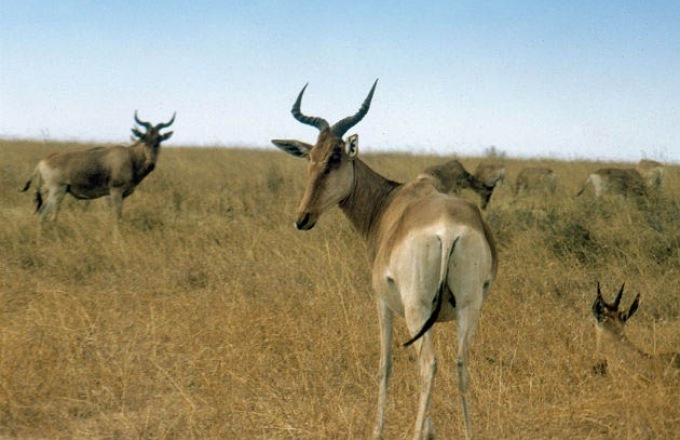 Game in Khwai is abundant and varied, and includes tsessebe, lechwe, wildebeest, impala, waterbuck, sable and giraffe. Dinner: Our camp cook will prepare appetizers and a dinner feast that we will enjoy in the open air under the stars. Dinners at camp are buffets with a starter, main entree with side dishes, and a dessert; bottled water and soft drinks are included, with alcohol available for purchase. Evening: Following dinner, we will have the opportunity to join together around a campfire. Breakfast: Served prior to the early morning game drive, breakfasts in camp are buffets with cold cereals, bread, fresh fruit and rusks (South African style biscotti); coffee/tea, fruit juice and bottled water provided. Morning: Searching for plains game and other species, we will take a morning game drive through a large variety of different vegetation types, down winding tracks, through mopane forests and across lush grasslands; each vehicle will have its own local safari expert. The scenic beauty of the area adds to our experience of Botswana’s verdant Garden of Eden, the Okavango Delta. We return to camp mid-morning, for a chance to freshen up and rest during the heat of the day. Lunch: Camp lunches are buffets with a mix of hot and cold breakfast and lunch items, such as salad, egg dishes, sausage, cold meats and cheeses, and pasta dishes, with dessert. Bottled water and soft drinks are included, with alcohol available for purchase. Afternoon: During afternoon tea time, our Group Leader will give a lecture on termites and their effect on the environment. Afterward, we embark on a game drive, where lion and leopard, and herds of buffalo, elephant and hippo are commonly found. We return to camp just after dusk. Dinner: In camp under the stars. Evening: If the skies are clear tonight, we will discover the constellations of the Southern Hemisphere. Morning: This morning, we will head out on a game drive to search for wild dog and other endangered carnivores. We return to camp mid-morning and have a few hours at leisure to rest, read, freshen up and relax in the heat of the day. Afternoon: During our afternoon tea-time lecture, we will learn about the Okavango Delta's hydrology and geology from our Group Leader. Afterward, we will take one last afternoon game drive in Khwai, keeping our eyes open for tsessebe, lechwe, wildebeest, impala, waterbuck, elephant, sable and giraffe. We return to camp just after dusk. Dinner: Enjoy scrumptious cuisine under the stars. Activity note: Charter flight time to Kasane is approximately 90 minutes. Morning: After breakfast, we will transfer to a nearby airstrip with game viewing en-route. We will take a small aircraft charter flight from the airstrip to Kasane (Chobe National Park). Upon arrival in Kasane, we will be met and driven in a minibus a short distance to a local lodge for lunch. Lunch: We will enjoy an expansive buffet lunch at a lodge near Chobe National Park, with numerous salad, main dish and dessert options. Bottled water provided, with other beverages available for purchase. Afternoon: This afternoon, we will explore the Chobe River by motorboat with a local safari expert, where we may come face to face with the elephant, buffalo and other wildlife that gather on the banks of the river to drink and bathe. We'll find ourselves immersed in the unique environment, viewing numerous birds including sacred ibis, blue heron, goliath heron, saddle-billed storks, marabou storks and little egrets. Chobe National Park remains one of Africa’s prime game-viewing areas. Here, one finds all of the “Big Five,” except for rhino. This is elephant country, home to the largest population of elephants in the world…many of these great grey giants can be seen at this time of year. (Note: Seasonality makes a big difference in how much game you will see. If it’s dry you will see larger herds; if it has recently rained the animals will be more dispersed). The park forms part of Botswana’s northern-most border and is a contrast of desert aridity and flood plains. The Chobe region is best known for its vast magnificent river and floodplains filled with grazing herds of big game. Buffalo, sable, lion, leopard, hippo, hyena, and many species of antelope find safety in this huge national park. Chobe is one of Africa’s most pristine ecosystems and greatest wildlife refuges. Following the Chobe boat cruise, we will be driven in a minibus across the Zimbabwe border to Imbabala Lodge, where we will have a chance to settle in and enjoy the riverfront scenery. Dinner: Dinners at the lodge are a small buffet with starter salad, main entree and side dish, and dessert. Bottled water, coffee, tea and local drinks are included. Evening: This evening, our Group Leader will give a lecture on elephant social structure and behavior. Breakfast: Served prior to the morning safari activity, breakfast at the lodge consists of various bread and cereal options, fresh fruit and hot items cooked to order. Coffee, tea, fruit juice and water provided. Morning: Our morning game drive will be in the private reserve surrounding the lodge, in the company of a local safari expert. The 5,000 acre national park concession has nearly nine miles of private Zambezi River frontage, and it borders the Chobe Forest Reserve which is renowned for its massive elephant population. Game drives here are taken in open-air safari vehicles in the early morning and late afternoons into evening, moving through the plains searching for predators and other game. We return to the lodge in the mid-morning, for a chance to rest and enjoy the lodge's amenities during the heat of the day. Lunch: Lunches at the lodge are a small buffet with starter salad, main entree and side dish, and dessert. Coffee, tea, water and local drinks included. Afternoon: Over afternoon tea, our Group Leader will lead a discussion on the past, present and future of Zimbabwe. Afterwards, we will embark on a game viewing boat cruise on the Zambezi River. Here, we may have the chance to spot wildlife coming to drink and bathe in the river, as well as observe the multitude of birds that gather on the river’s banks, all while enjoying a spectacular African sunset. We return to the lodge after dusk, with a chance to freshen-up before dinner. Dinner: Dinner at the lodge. Breakfast: Breakfast at the lodge. Morning: Morning game drive in the private reserve, returning to the lodge in the mid-morning. The heat of the day is at leisure. Lunch: Lunch at the lodge. Afternoon: Over afternoon tea, our group leader will give a lecture on David Livingstone and his discovery of the Falls, in preparation for our visit tomorrow. In the late afternoon, we will embark on our last game drive within the private reserve, returning to the lodge just after dusk. Activity note: Drive time between Imbabala Lodge and Victoria Falls is 1 hour. In order to see all viewpoints at the Falls, approximate length of walk is 2 miles. It is possible to walk less and see some, but not all, viewpoints. Paths may be slick from mist, but are mostly flat. Drive time between Victoria Falls and Thorntree Lodge is approximately 1 hour including border crossing. Morning: Boarding our minibus, a morning departure will takes us to Victoria Falls, where we will have a chance to view the Falls on the Zimbabwean side. Since the waterfall spans the border between Zambia and Zimbabwe, it is visible from both countries. However, the majority of the water falls on the Zimbabwean side. Viewing the Falls from this side provides numerous overlooks and truly gives you a feel for the full majesty of this natural wonder. Here our Group Leader shows us how, through the millennia, the forces of nature have created this marvelous spectacle, Africa’s greatest waterfall. Afterward, we will transfer over the Zambian border via the stunning bridge that spans the Batoka Gorge just downstream from the Falls. Lunch: Lunches at the lodge vary each day between plated a la carte choices and buffet options. There will always be a starter, main entree with assorted vegetable or starch side dishes, and a dessert. Bottled water, coffee and tea provided with other beverages available for purchase. Afternoon: Free Time. Take this opportunity for personal independent exploration to see and do what interests you most. Please refer to the list of Free Time Opportunities. The Group Leader will be happy to offer suggestions. In the early evening, our Group Leader will give an overview on Zambian history and culture. Dinner: Dinners at the lodge vary each night between plated a la carte choices and buffet options. There will always be a starter, main entree with assorted vegetable or starch side dishes, and a dessert. Bottled water, coffee and tea provided with other beverages available for purchase. Activity note: Flight time from Livingstone to Lusaka is 70 minutes, and Lusaka to Mfuwe is 70 minutes. Drive from Mfuwe Airport to Mfuwe Lodge is 45 minutes. Breakfast: Breakfast buffet at the lodge with a variety of cereal and bread choices, fresh fruit and hot items. Coffee, tea, fruit juice and water provided. Morning: In our minibus, we will transfer into town for a visit to the Livingstone Museum in the company of a museum docent. Known for its archaeological and ethnographic displays, the small museum also hosts a detailed exhibit on Dr. David Livingstone, including letters and other artifacts that belonged to the storied explorer. From the museum, we will transfer to the Livingstone Airport and depart on a scheduled flight to Lusaka, and then continue on to the Mfuwe Airport in the South Luangwa Valley. Afternoon: Upon a late-afternoon arrival into Mfuwe, we will be met by our local safari specialists and driven in open-air, 4x4 safari vehicles to Mfuwe Lodge. We will have time to settle into our rooms before dinner is served. Dinner: At the lodge. Dinners here vary between a three-course meal and a buffet. Also, a traditional South African barbeque or “braii,” where guests eat in the outdoor eating area or “boma," is offered at times. Bottled water is included with additional beverages available for purchase. Please note that dinners at the lodge are served later in the evenings, around 8:30pm, following the return of the night game drives. Breakfast: Early morning cereal, toast and fruit served at the lodge, followed by mid-morning snacks in the bush (tea and coffee, muffins and cookies). Morning: This morning, we will either participate in a guided bush walk with our local safari expert and an armed guard, or go on a game drive with a local safari expert. During the bush walk, our local expert will provide insight into tracking, local flora, any wildlife seen, as well as point out the smaller residents in the bush. Following the safari activity, we will return to the lodge mid-morning for a chance to freshen-up before the mid-day meal. Brunch: Brunch at the lodge consists of a full buffet including many cooked breakfast and lunch items as well as salads and desserts. Water, coffee and tea provided, with additional beverages available for purchase. Afternoon: During the heat of mid-day, we will have a chance to enjoy the lodge's amenities, or view game from the deck of our private chalets as the animals come to drink from the lagoons around camp. During afternoon tea, we will have a lecture on the unique surrounding ecosystem and the structure of the Zambian National Parks, given by a local expert. Afterward, we'll embark on a day-into-night game drive, where leopard, hyena, porcupine, civet, genet and honey badger are commonly sighted. After dark, our local safari expert will use a spotlight to find animals in the bush. We return to the lodge in the late evening, just before dinner. Breakfast: Early continental breakfast at the lodge and mid-morning snacks on drive. Morning: Again this morning, we have the choice of a game drive or a bush walk with our local specialist and an armed guard, which will emphasize spoor, vegetation, birds, insects and bush lore. We return to the lodge mid-morning, after the safari activity. Afternoon: Boarding our open-air safari vehicles, we will visit a nearby school and textiles manufacturing site, located just outside the national park's boundaries. Our stay at Mfuwe Lodge in part funds the Mfuwe community fund, which helps support the lunch program at the school. We will be shown around the school and learn about the school’s projects, as well as have the opportunity to interact with the children when school is in session. We will continue to a textiles manufacturing shop, which employs and trains members of the local community, making beautiful, hand-painted textiles. Our afternoon is topped off with sundowners set up in a beautiful location back in the national park (weather permitting). We return to the lodge just after sunset, in time to freshen-up before dinner. Breakfast: Early morning tea/coffee and continental breakfast at the lodge, with snacks provided during the game drive. Morning: We will search the surrounding area for animals that may have eluded us thus far, heading back to the lodge mid-morning. Afternoon: The heat of the day is spent at the lodge, at leisure. Over tea, our Group Leader will give a lecture on lion social structure and behavior. We will end the afternoon with one last game drive in the South Luangwa National Park. Dinner: Farewell dinner at the lodge. Evening: During our final evening as a group, we will enjoy reminiscing about the program's unique experiences. Activity note: Flight time Mfuwe to Lusaka is 70 minutes; flight from Lusaka to Johannesburg is 2 hours. See your program’s travel details regarding transfers. If you are an independent traveler (POP status), see “Ground Transportation from Last Location." Morning: In our open-air safari vehicles, we will transfer to the Mfuwe Airport for a scheduled flight to Lusaka, Zambia. Lunch: Boxed snacks provided, as well as an airline lunch in-flight. Afternoon: Board a commercial flight to Johannesburg's OR Tambo International Airport. Upon arrival in Joahnnesburg, connect to your international return flight. This concludes our program. If you are returning home, safe travels. If you are staying on independently, have a wonderful time. If you are transferring to another Road Scholar program, detailed instructions are included in your Information Packet for that program. We hope you enjoy Road Scholar learning adventures and look forward to having you on rewarding programs in the future. Please join our Facebook page and share photos of your program. Visit us at www.facebook.com/rsadventures. Best wishes for all your journeys! Morning: Early morning arrivals in North America. An authentic, tented safari camp is set up in a private location with Hemingway-style safari tents. Each tent has two beds with linens and an attached bathroom with long-drop toilet and bucket shower (hot water on request). All meals are taken in casual safari style near the campfire and shaded by many large trees. The Imbabala Zambezi Safari Lodge is a beautiful thatched lodge resting by the Zambezi River in Zimbabwe. Due to its border with the Chobe Forest Reserve, Imbabala is a regular stop for elephant herds. The lodge features a lounge, dining room, and bar area but meals are often served outside by a hospitable staff. Rooms are stone and thatch mini-lodges with breathtaking views of the Zambezi River and a watering hole where animals often congregate. During the day guests can take advantage of morning and afternoon game drives, river safaris, walking safaris, fishing safaris, and more. Imbabala has an excellent location for those exploring Southern Africa: the lodge is approximately 30 minutes to Chobe National Park (Botswana), 90 minutes to Livingstone (Zambia) Airport, and 60 minutes to Victoria Falls (Zimbabwe) Airport. Thorntree River Lodge is a wonderfully situated lodge on the banks of the Zambezi River. The newly built fabric-covered chalets, hidden in the bush, are raised on elevated structures to enhance guests' connection with their surroundings. With a refreshing modern look and soft, traditional elements, Thorntree provides a balanced, relaxing atmosphere. The wide sweeping panorama of the river lends a special magic to the location. Thorntree's riverside location and its unique position within the Mosi-Oa-Tunya National Park allow for a wide choice of activities, including sunset cruises, game-drives, cultural tours, fishing, and visit to Victoria Falls. The esteemed national park is a sanctuary for white rhino as well as a haven for many other species including giraffe, sable, zebra, wildebeest, buffalo and a wide variety of birds. Mfuwe Lodge is situated in the heart of the South Luangwa National Park and is built between two spectacular lagoons. The open plan design keeps the comfort and relaxation of guests in mind, but also capitalizes on the fact that an African wilderness experience is a blend of colors, textures, sounds, aromas and sights unmatched anywhere else in the world. Each chalet has a large private deck overlooking one of the lagoons. From the comfort of the lodge you can view Africa's majestic wildlife as animals come down to drink. Elephant, hippopotamus, many antelope species and crocodiles are plentiful in this area. Andre Joubert has held numerous positions in managing and providing wildlife education throughout Botswana, Namibia, South Africa, Zimbabwe and Zambia. This South African-born outdoorsman served as park warden of Skeleton Coast Park in Namibia and chief warden of Botswana’s Khama Rhino Sanctuary, whose objective was to save Botswana’s last remaining White Rhinoceros population. Andre shares a passion for working with people and instilling his strong wilderness ethics in public education. Group size limited to 17. Some dates of this program can be taken back to back with program #22444, The Best of South Africa: Safari, Culture & the Garden Route. Due to the nature of this program, listening devices are not available.